Hay y'all, come join us for the California Alfalfa and Forage Symposium in Reno, NV, November 27-29, 2018! 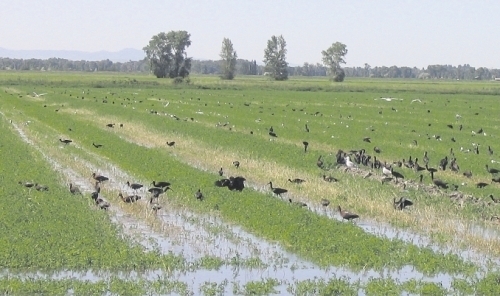 Birds foraging for insects and rodents in flood irrigated alfalfa. Photo: Capital Press. Day 1 (Nov 27), pre-symposium workshop: Soil Health & Fertility Workshop, combining lectures and hands-on demonstrations. Days 2 and 3 (Nov 28-29): 1.5-day symposium featuring industry trends, pest management, economics and markets, dairy update, exports, regulations, forage quality, water management, and genetics. These are just a few of the topics that will be covered in this year's symposium. Now in its 48th year, the Alfalfa Symposium is a comprehensive and educational program for anyone with an interest in important issues related to alfalfa and forages. Typically, we have 450-800 attendees and 60-90 exhibitors. Be sure to join us for some fun at the exhibitor receptions and CAFA Auction! The symposium program was developed by the University of California Alfalfa Workgroup (UC Cooperative Extension), and the California Alfalfa & Forage Association (CAFA).